FIX IT has done a lot of flying with robots over the years. One team member added it up and our robots have spent over 192 hours flying on planes! Here are some ideas we’ve used. Back in 2009, one of our parents made a plywood box for our robot. There’s a pdf with more info about our travel box. 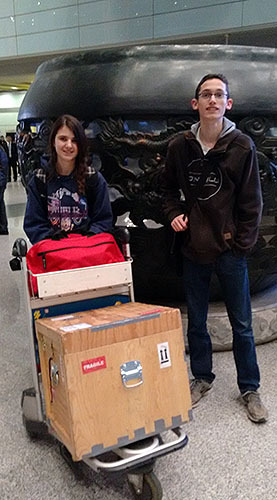 The robot box has flown everywhere from around North America to Australia and China. The important things are to make sure the exterior dimensions don’t exceed the checked baggage dimensions (usually 62″). Our box is 20″ wide x 20″ long x 20″ high = 60″. When we took it to China, we added wheels to the base. They screwed in after we picked it up at the airport. There are fancy options where the wheels can pop-out and lock in place after you arrive. We go for the low budget option. Watch the total weight. Often we have to remove a couple of things to get it under 50lbs (start with easy things like side panels and accessible motors). Over 50lbs can be very expensive! We do have some foam pieces that fit around the robot. Assume the box is going to be put upside down at some point. Look at all the robot’s surfaces and protect anything that could be damaged. The year we had an arm on the top of the robot, we attached the robot to a frame and screwed that to the box. Even upside down, most of the robot wasn’t touching the sides of the box. Most teams have a rolling cart at large events. There’s often a lot of walking between the pit and the competition field. Unless you have a large team of strong students, or a very lightweight robot, get a cart. Here’s an example from Amazon, but there are lots of possibilities. Keep the box. Our cart comes apart easily and packs back into it’s box. It takes a lot of tape to keep the box together, but it’s worth it. As we are packing, a lot of our tools and pit display materials are stored in the shelves inside box. Heavier items, usually tools like a hammer, are taped to the shelf so they don’t move around in transit. With all the extras, the cart box usually comes in around 40-45lbs and is our 2nd piece of checked luggage. From there it’s a team decision. Usually we have about another 35-40lbs of stuff (motors, spare parts, giveaways). Sometimes we pack it all into one suitcase and the team has three pieces of checked luggage. Other times, we split the stuff between team members and they put it in their own suitcases. Both approaches can work. The final step is one piece of rolling carry-on luggage. It has our team hats so they don’t get crushed, the phones and tetrix batteries. The batteries are packed in a ziploc with the specs from the Pitsco website so that if they want to know what type of battery, the info is easily available. Expect to have that bag hand searched. They always want to look at the batteries. I try to send that bag (and person), through security first so they are finished by the time the rest of the team is through screening. Make sure the team double checks their backpacks and laptop bags as part of packing. Many team members end up at the airport with tools they didn’t even realize they had in their laptop bag! Most of these items have to be left at security, so have everyone check all the pockets of their carry-on bags before you leave. Pack a letter with a picture of the robot on the top of robot box, cart box and any suitcases with ‘odd’ items. Security is going to look in your checked luggage. They may be gentler if they know what they are looking at. FIRST will sometimes send out a travel letter, but we always include our own travel letter too. Safe travels for your team and your robot!